The Dark Blues’ only change from the St Mirren match was Paul McGowan starting instead of the injured Benjamin Källman. Hibs made two changes; Paul Hanlon and Daryl Horgan came in for Darren McGregor and Vykintas Slivka. This time last season Dundee conceded a goal after only a minute at Easter Road when they lost possession and Hibs raced up the field to score. Today it took only 40 seconds for exactly the same nightmare opening to unfold. Calvin Miller lost the ball attacking deep in Hibs’ half. Martin Boyle raced up the right wing and passed infield to Daryl Horgan, whose floated cross to the far post found Genseric Kusunga stretching to try and turn the ball out for a corner. Instead his header found the inside of the post and the ball was nestling in the back of the net. To their credit the Dee picked themselves up and played some good, attacking football, unsettling the Hibees’ defence with neat movement and passing. Dundee had the better of the next 20 minutes, but with fewer attacks Hibs looked every bit as dangerous. At either end Calvin Miller and Martin Boyle flashed dangerous low balls across goal with no takers. 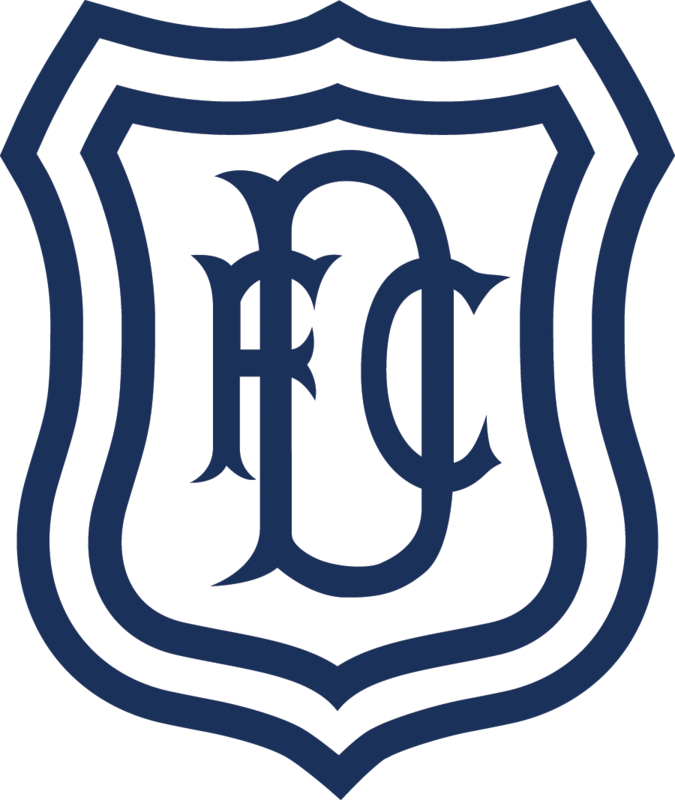 Dundee passed up a great chance when an unorthodox crossfield pass by Paul McGowan gave Glen Kamara space and his chipped cross found Kenny Miller unmarked. The striker connected well with his header, but Adam Bogdan made a great save. The Dee had a let off when Jack Hamilton dropped a cross and only frantic goalmouth blocking stopped two shots from Jamie Maclaren. The second goal was postponed for only a couple of minutes, however. 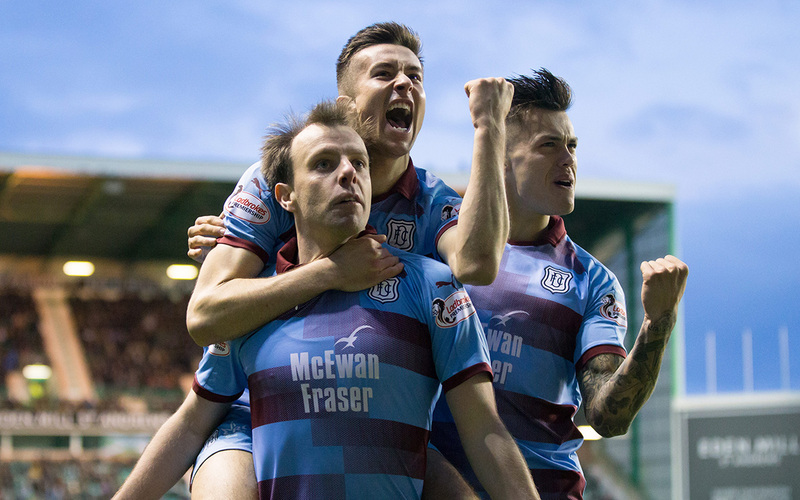 Stevie Mallan flighted a free kick from the right to the far post and Ryan PORTEOUS powered his header past Hamilton. The Dee were shaken and Hibs looked briefly as if they would run away with the match. Two minutes after the goal Maclaren whipped an angled shot past the far post as the home crowd smelled blood. Dundee pulled themselves together and played their way back into the match, not taking unnecessary risks and drawing the sting out of Hibs. First half injury time brought the goal the Dee desperately needed. Nathan Ralph made a terrific run down the left and played a perfect low cross into the six yard box for Kenny MILLER to steer the ball past Bogdan and inside the far post. The finish was neat, but the assist was delightful. The goal gave the Dee a huge boost and they started the second half with a belief that they could save the game. It took only two minutes to equalise with a goal that surpassed the first. Jesse Curran broke through from the half way line, racing past a couple of challenges. After pulling the Hibs defence out of position he played in Paul McGOWAN, who cut inside his man before curling a left foot shot round Bogdan from 15 yards. Hibs were rocked by the goal and Dundee attacked confidently. Curran almost scored the third following another driving run into the penalty area, but Bogdan managed to turn his shot round the post. The Hibees reorganised, sending on Marvin Bartley and Thomas Agyepong. That helped Hibs settle down, but they never had the fluency or sustained pressure that their fans would have expected. There was the odd flash of danger, but Dundee never allowed them to settle down and build attacks they way they wanted. Boyle went close when he made space to hit a cross shot from 15 yards past the far post, and in injury time Porteous improvised with an overhead attempt from a free kick that flew a couple of feet wide. Dundee were composed, organised and hard working. They often looked dangerous on the break in the last half hour, but couldn’t quite find the right final pass that would have set up a chance. The game ended with the Dark Blues camped firmly in the corner at the Hibs end in front of the Dundee fans, calmly killing the match and settling for the point they fully deserved. Dundee might still be at the bottom of the table, but looked nothing like relegation candidates today. They reacted superbly to an awful start and played some good football, while always grafting hard. The defenders kept their heads, always throwing themselves in front of the ball when they had to. Nathan Ralph has had a difficult start to his Dundee career, but he coped very well with Martin Boyle’s attempts to run at him, linked well with the midfield and can claim a fine assist for the first goal. The midfield played some good football, and in particular young Jesse Curran had a very good match, causing Hibs problems they often struggled to deal with. There were certainly very good individual performances, but the real highlight was the way team as a whole played and pulled together in adversity. There is a long way to go, but if the players can keep this up there is cause for optimism. Unused subs: Marciano (gk), Whittaker, Slivka, Mackie. Goals: Kusunga og (40 secs), Porteous (30). Booked: Milligan (foul on Kenny Miller), Hanlon (foul on Curran), Bogdan (time-wasting). Unused subs: Parish (gk), Ngwatala, Inniss, Boyle. Goals: Kenny Miller (45+1), McGowan (47). Booked: O’Dea (foul on Mallan). Referee: Greg Aitken. Assistants: Andy Milne, Paul O’Neill. Fourth Official: Bobby Madden.